Special Olympics transforms lives through the joy of sport, every day, everywhere. We are the world’s largest sports organization for people with intellectual disabilities: with more than 4.9 million athletes in 172 countries -- and over a million volunteers. 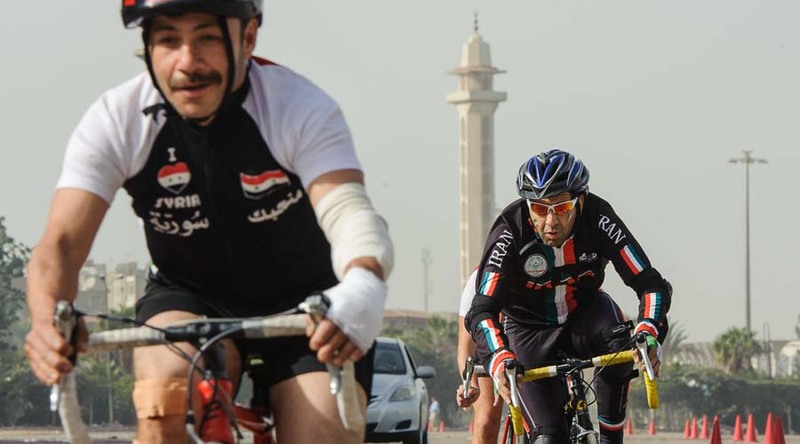 Cyclists from Syria and Iran compete at Middle East-North Africa regional games in Cairo, Egypt. Special Olympics transforms lives through the joy of sport, every day, everywhere. We are the world’s largest sports organization for people with intellectual disabilities: with more than 5 million athletes in over 170 countries -- and over a million volunteers. 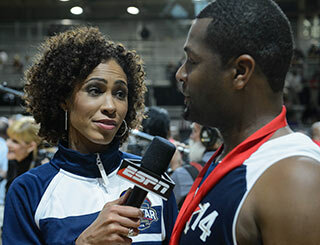 Special Olympics athlete Travis Jackson is interviewed by ESPN after playing in a unified basketball game with NBA and WNBA stars. 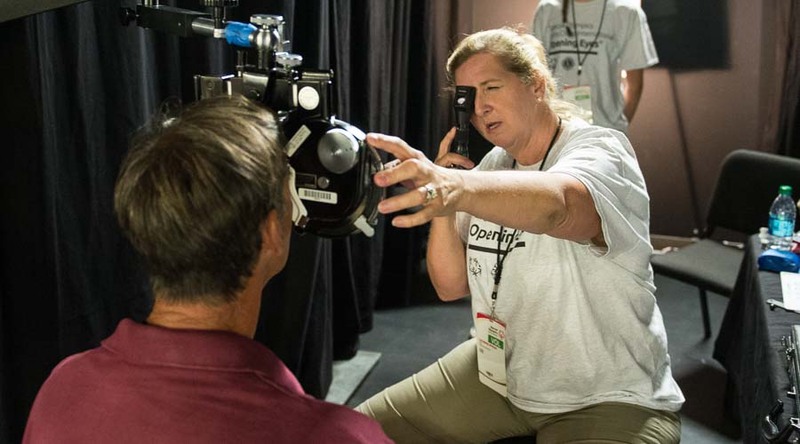 Special Olympics has performed over 1.6 million free health examinations for our athletes, opening a door to health care many with intellectual disabilities find hard or impossible to access. Volunteers from Mattel are among the many people involved with our Young Athletes program, which gives kids 2 to 7 years old an introduction to sports and play. Through the power of sports, people with intellectual disabilities discover new strengths and abilities, skills and success. Our athletes find joy, confidence and fulfillment -- on the playing field and in life. They also inspire people in their communities and elsewhere to open their hearts to a wider world of human talents and potential. Here's a slideshow showing the full spectrum of our activities. Through sports, we showcase the skills and dignity of our athletes. 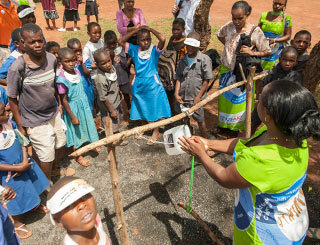 We also bring together communities to see and take part in the transformative power of sports. We know the odds our athletes must overcome and the barriers they face every single day. We see this at training events and competitions as our athletes push to beat their personal bests -- and exceed them. Their stories and successes inspire us all. We believe in a world where there are millions of different abilities but not disabilities. And we're spreading this message everywhere - at big Special Olympics events and small ones. Sports are a powerful force. Sports can shift the focus from disability to ability, from isolation to involvement. We offer the highest quality Olympic-style sports training and competition for people with intellectual disabilities all around the world. This changes attitudes and changes lives. The transformative power of sports to instill confidence, improve health and inspire a sense of competition is at the core of what Special Olympics does. From the detailed coaching guides we provide in many languages to the sharp-eyed officials at our international games, the focus is on real sports, real competition, real achievements. Since 1968, Special Olympics has been spreading the message: people with intellectual disabilities can – and will – succeed when given the opportunity. And it all happens through the simple power of sport. At Special Olympics, we believe that sports can teach us all important lessons. When we train and strive for a goal, it teaches us to dream. When we struggle, it teaches us determination. When we win, we find joy. And if we lose, we can find the strength to try again. Our sports events bring together a large and inclusive community of athletes, supporters and families, coaches, volunteers and many others. 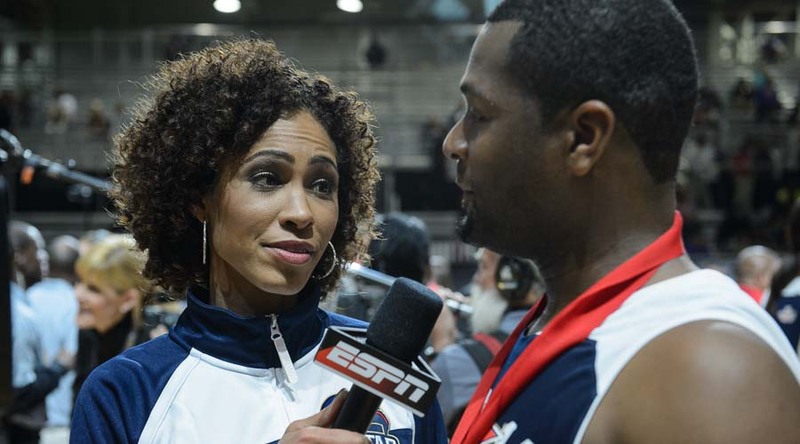 The athletes are at the center of it all -- to the shared joy of themselves, their families and their communities. These events help us all rediscover the purity of sports -- and real athletic pursuits -- based on true Olympic ideals. There are up to 200 million people with intellectual disabilities around the world. We want to reach out to every one of them – and their families and communities as well. 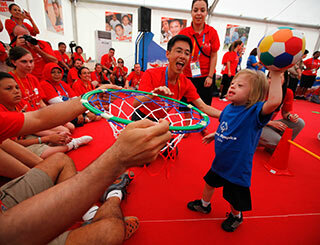 Special Olympics does this through a wide range of trainings, competitions, health screenings and fund-raising events. We also create opportunities for families, community members, local leaders, businesses, law enforcement, celebrities, dignitaries and others to team together to change attitudes and support athletes. Some of our key program efforts to build communities include: Unified Sports, Athlete Leadership programs, Family Engagement, Healthy Athletes and Young Athletes. Since Day 1, Special Olympics has been based on the premise that lasting change must start with young people. Every day, we are working together to inspire long-term transformations in the actions and attitudes of the next generation, with the goal of creating a more inclusive world than ever before. Through sports and leadership activities, Special Olympics provides opportunities for young people of all abilities to be leaders in their schools and communities. These leadership activities help students with and without intellectual disabilities find their voices by teaching them to become change agents, striving for respect and inclusion. And sports helps everyone get fitter and healthier -- together! These programs include the Special Olympics Unified Strategy for Schools and Youth. This initiative is based on the evidence that students who “play unified” become better at helping others, sharing responsibility, and standing up for each other. We also see how students involved in Special Olympics Unified programs gain patience and the ability to compromise. They learn to embrace diversity and respect differences. This leads to higher levels of social and emotional security for ALL students, with and without disabilities, who feel safe from teasing, bullying and social exclusion. Students of all abilities also have the power to positively impact their communities by promoting social inclusion through our Spread the Word to End the Word®, Get Into It, and SO College programs. 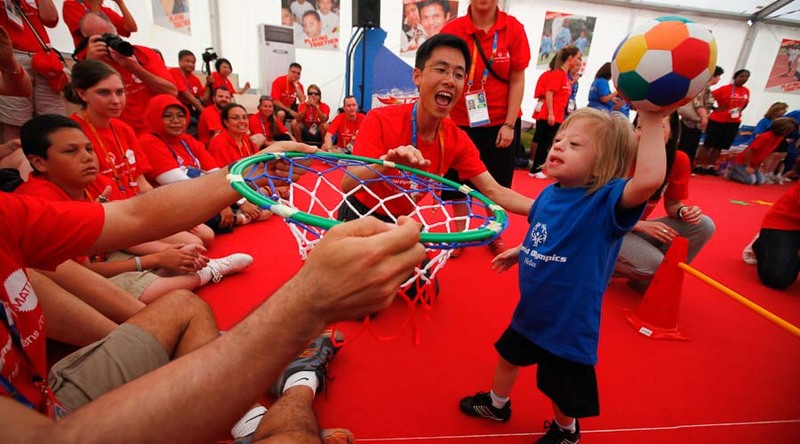 Special Olympics is also the world's largest public health organization for people with intellectual disabilities. Many of our athletes come to us with neglected health problems. At World Games and other events, we offer a wide range of free health exams and care. Justice means being morally right, equitable and fair. Changing lives for the better means giving people services that make a positive impact. Neither is possible without a solid understanding of what’s needed, and a plan for how to provide it. Special Olympics leads the world in researching and addressing the concerns of people with intellectual disabilities. We identify the pressing issues facing this group, commission and conduct high-level, externally validated scientific research, then reach out to the highest leaders in government, health care, education, the nonprofit sector and business to influence policy and to bring valuable services to those in need. 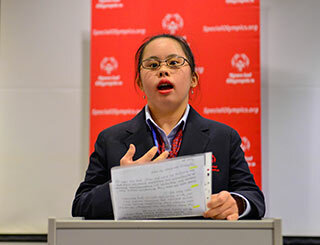 Special Olympics’ research into intellectual disability, and perceptions of those who have intellectual disability, is a catalytic force for social and policy change around the globe. See a list of research studies commissioned by Special Olympics. Special Olympics Young Athletes™ is a unique sport and play program for children with intellectual disabilities. The focus is on fun activities that are important to mental and physical growth. Children ages 2 to 7 enjoy games and activities that develop motor skills and hand-eye coordination. The Young Athletes program helps children all around the world, thanks to the support of The Mattel Children's Foundation, Toys“R”Us, Kim Samuel and the Lynch Family Foundation. Their help leads children with intellectual disabilities into a bright new world of sports and social skills, pride and possibility. 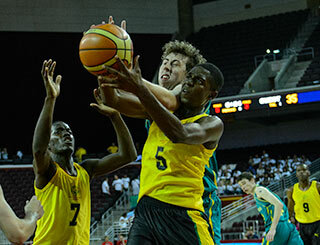 For information and resources see our Young Athletes Toolkit. Through sports training and competitions, Special Olympics helps people with intellectual disabilities achieve joy, acceptance and success. They gain the confidence that comes with achievement. They feel empowered. Our Athlete Leadership programs can take athletes even farther -- as leaders and spokespeople respected in their communities. Many athletes choose to undergo training to learn presentation skills so they can help spread the message of Special Olympics to the general public. Some are selected by the Board of Directors to serve as Sargent Shriver International Global Messengers. 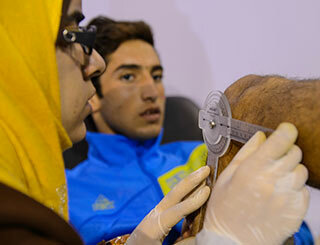 Athlete Leadership trainings are offered in 67 countries and are initiated at the grass-roots level. Many athletes are trained to engage in policy discussions and to articulate their opinions to community and government leaders.